There are four colors for choices : silver , blue , red , and black. 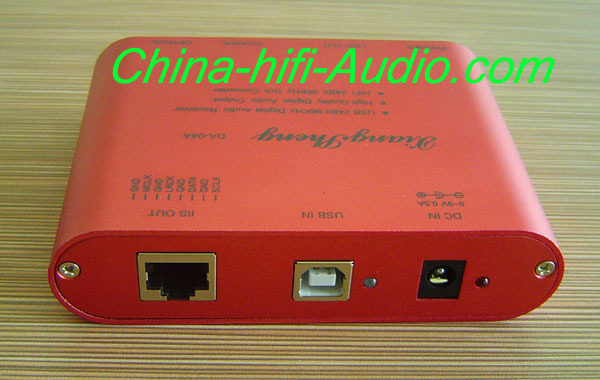 a) IIS digital signal output, you can connect to the DAC chip IIS input with a special cable for better digital signals. c) USB connection indicator lights to indicate normal USB power. d) External power input socket, positive negative, the input DC 6-9V, currents greater than 0.5A. e) External power indicator lights to indicate that the external power supply is normal, while USB indicator goes off. f) Headphone jack, you can spider 32-600 ohm headphones. g) Right channel line output. h) Left channel line output. i) Coaxial digital signal output, you can pick another more upscale digital decoder. j) Optical digital output, you can pick another more upscale digital decoder. k) When your laptop is charging, it may make noise if you are using the headphone amplifier at the same time. Digital Audio Inputs: USB input. Signal Outputs: (1) COAXIAL (1)OPTICAL(1) IIS digital output and (2 )analog stereo outputs via RCA Left/Right channel. Resolution Capability: supports 16bit、20bit and 24bit audio depending on source. This product was added to our catalog on Friday 26 December, 2014.